I’m ready to get back into “lean out” mode. Reflecting on my goals for 2012, I see that I can maintain my weight with ease. And I can put the brakes on “chart creep”. However, I’m determined to make sports – particularly running – more fun by lightening up. So today I cracked open my training logs and diet advice from a variety of sources and formulated the beginnings of a plan. I have several goals – fat loss; optimal health; super powers. On fat loss, Robb Wolf wrote an interesting postlately in which he concluded that calories do matter. I have to agree. I’ve been most successful in shrinking my waist line when I’ve combined low carb and low cal. I figured out my BMR and maintenance intake and made several pages of notes on the various ways to calculate these numbers. I’m convinced though it’s a WAG. 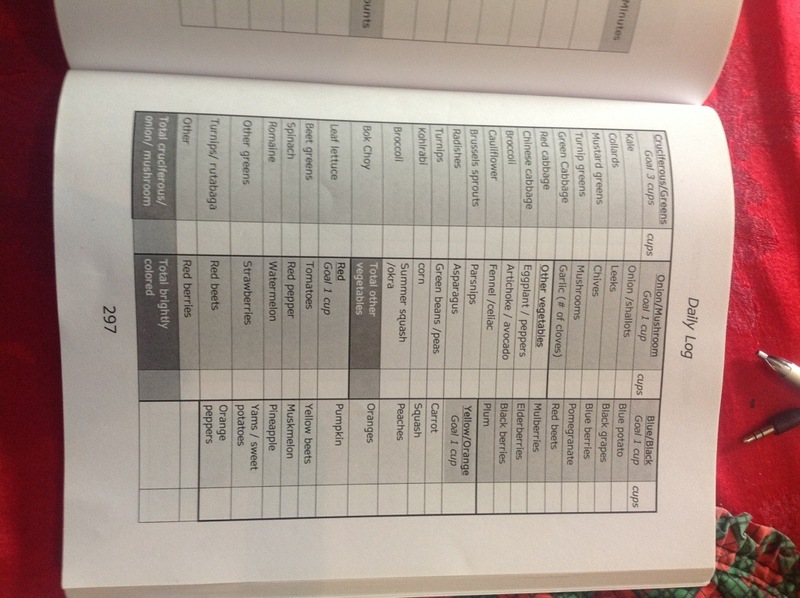 Pick a number, give it a try, keep good records, evaluate results. On optimal health, I like the science behind avoiding gluten and lectins. I have been experiencing some joint pain lately, and I’d like to see whether I can reduce bodily inflammation with diet. I keep wishing that I could kick the milk habit, but I love my lattes. Or rather, the sugar in milk. I notice that when I substitute coconut milk, I still like the taste, but I don’t finish my coffee. So I’m (again) thinking about kicking the coffee (as a way to kick the dairy). I will maintain skeptical optimism as we enter the New Year. On super powers, I have been reading about low-carb athletic performance. Again, I am intrigued, but have not “made the switch.” When I look at my training journal, I have gained between 5 and 10 lbs. during training season every year. I think that’s got to be some muscle, some bodily adaptation (blood volume etc.) and some fat stored in reaction to eating sugary foods (gatorade, gel, etc.) and eating more than I am using. I’m also intrigued by the ketogenic version of the diet recommended by Dr Wahl to ensure mitochondria are adequately nourished. All this pondering leaves me with the question, What’s for dinner? My plan is to build meal templates that will meet my calorie goals and stick to the plan. A lot of folks are planning a Paleo January (or a Whole 30). I am going to resist the suggestion to stay away from the scale and to refrain from weighing & measuring. I already eat really well. I have some specific goals that I think I can achieve through gathering data (through measurement and observation), not just by putting good food on my plate. I’ll share the details as I get them worked out. Posted in mindfulness. Bookmark the permalink. every year I hope I prepare in advance. so far that’s a FAIL. November blows by. I’m in denial until 15 December, fretting on 20 December and shopping on 24 December. This year was no different. So I let go of perfectionism and trimmed my to-do list. I am enjoying our beautiful tree and some delicious chili I made in the Dutch oven while we were out finishing up our shopping today. For breakfast I enjoyed some coconut soup, which I recommend for leftover meat. pressure cooker: bring to high pressure for 5 minutes, quick release. Add raw, diced red pepper to your bowl. stove top: simmer for 15 minutes. 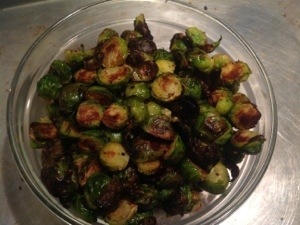 Posted in mindfulness, Recipes. Bookmark the permalink. I got out of the habit of twice filling the water pitcher that sits on my desk. More than writing out what I eat, photographing each meal showed me just how much coffee I like to drink. I have switched to herb tea most mornings. And cut back on the coffee at work. And I’m filling up the water pitcher at least twice a day. I noticed that sometimes I think I’m hungry, but really I’m just thirsty. Soup for breakfast is working pretty well. (double credit. Water + vegetables). And I dug out of the basement a mini-crock pot. I put the ingredients together at night and have a nice meal ready in the morning. The mini-crock makes enough for two servings. So far, veg soup, chicken soup, pumpkin soup and beef soup. I’ve been keeping a food journal with my camera. What an eye opener. I eat the same things repeatedly, and I drink coffee. A lot. And not as many veggies as I think I should. The earlier-breakfast task from last week was a success most days of the week. This week – eat more greens. I find that in cold weather I’m not as interested in eating salads with my dinner. But I love soup. This weekend I threw a bunch of stuff from the crisper drawer (carrots, onions ) into my steam pot and chopped up a cauliflower. That went into the pot too. A little coconut milk and some piri piri turned the mix into a tasty soup. I added two soft boiled eggs on top. Just right. 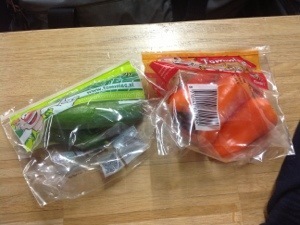 Below are packaged veggies from the high school vending machine, a perfect snack to enjoy while watching my sons play.